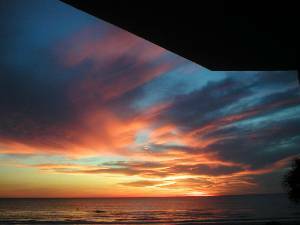 Stay in the Very Best in Indian Shores! April and May Specials! Bedding Information: Sleeps 6, King, Queen and set of Twins. 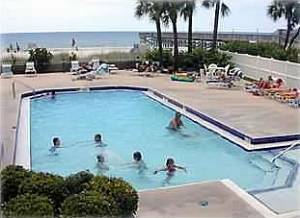 Beach Palms formerly known as Beach Cottages III Luxury Beachfront Indian Shores Condo Rental Spoil your family - stay at the best on the West Coast Beach. Capture the sunsets from the balcony of our elegant, Non-Smoking, 1900 SQ.FT. corner condo at the premier Beach Palms, formerly known as Beach Cottage III Resort. Lounge at our beautiful tropical garden pool (heated in the winter season) for year around swimming. Lounge chairs and umbrellas are on the deck area and the pool is surrounded by swaying palm trees and lush tropical plants. 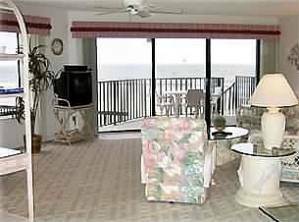 Our upscale, lovely appointed, three bedroom, two bath, oversized, corner condo allows you to walk down to the sandy beach right from the balcony staircase. The master bedroom and living room open directly to the balcony with a panoramic view of the calming waters of the Gulf of Mexico to watch those breathtaking sunsets every evening. The second guest bedroom also has a private balcony. The Beach Palms property is well maintained for your pleasure with security on site. Our condo has an underground private parking space.We also have a surprise closet filled with beach toys,floots,ice chest and beach chairs for your use. HANDICAPPED EQUIPPED! 4 tvs. Our unit has FREE WIFI! 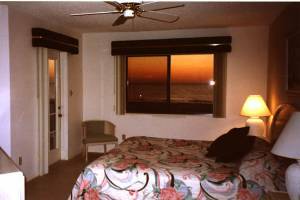 The condo is excellent, exactly as described, overlooking the beach with beautiful sunsets. Just about to depart for our sixth visit in three years, liked it so much that on our second visit there we got married there. Alison and George Wheeler, Colchester, England. Holidays other than July 4th, Christmas & New Years, add 10%. Add $100.00 cleaning fee and 12% Florida tax. Deposit: $250.00 required for deposit to rent . 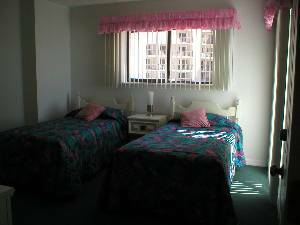 Cancellations and Refunds: $100.00 cancellation fee taken from deposit to rent. No refund on any received money if cancellation is 1 to 30 days prior to arrival.